To ring in the holidays this year, I've asked a few friends who know their way around a kitchen to help us navigate our own with a tiny bit more grace and flavor. First up is Alison Altomari, the culinary mind behind the beautiful blog, a la Alison. We met years ago at my healthcare communications job and she's since gone on to live one of the most enviable lives on the books: working in a restaurant in Barcelona, globe trotting far and wide and now exploring northern California - and cooking and taking beautiful photos all along the way. She came up with this recipe while food shopping at the Monterey Market in Berkeley. 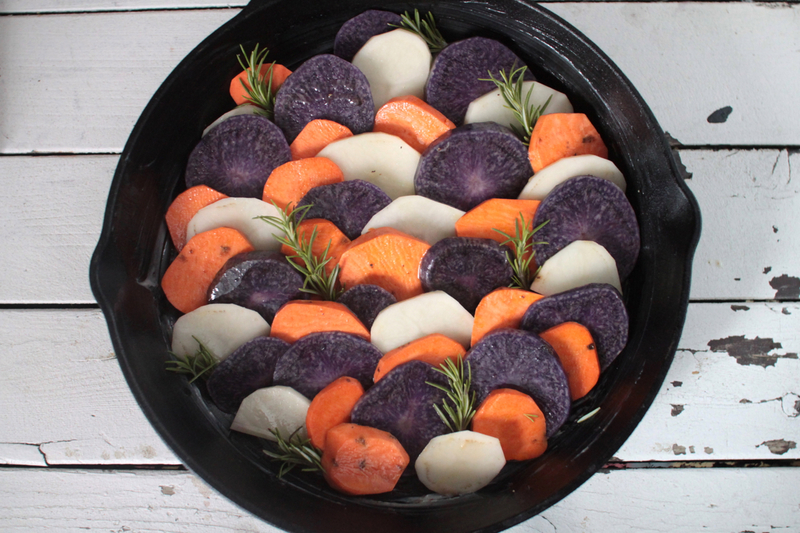 It's the total trifecta of holiday recipes: delicious, beautiful, and easy as hell - and only one pot to clean! The trick is high heat. Since the potatoes will be nestled up against each other, they will steam a bit. To get a good crisp on the potato, cook at 425. The house will fill with a wonderful smell of rosemary. 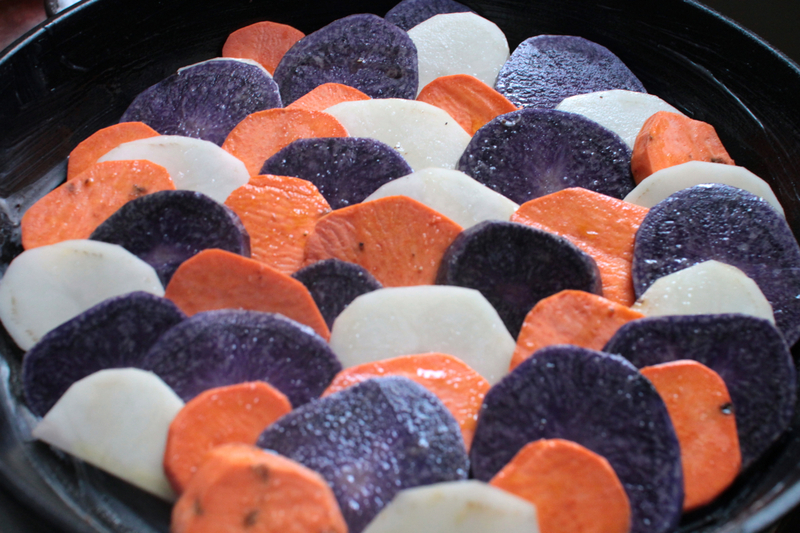 Heat the oven to 425 degrees F. Peel the potatoes and cut into 1/4"-1/2" thick slices. Place in a bowl and pour some extra virgin olive oil, a pinch of coarse salt (kosher or sea salt will do), and a bit of black pepper. Toss to coat. 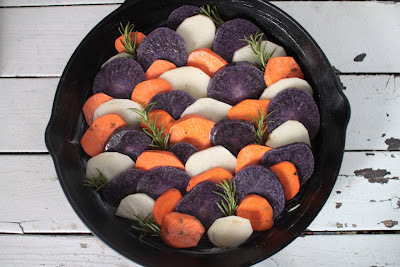 Lay the potatoes out in the cast iron skillet alternating colors, and laying out like fish scales. 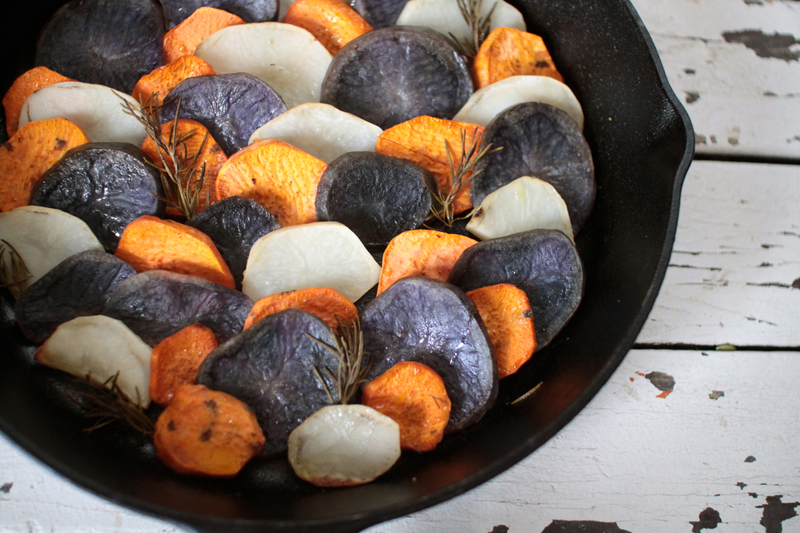 Slip a few sprigs of rosemary in the skillet and roast for 35-45 minutes, or until golden crisp and tender.